The transformation story continues at the History Center beginning May 1, 2015. With funds from the State of Ohio, and in partnership with Behnke Associates, Inc. and F. Buddie Contracting, WRHS will renovate the parking lot and exterior grounds leading to the Reinberger Plaza entrance at the History Center in University Circle. The improvements include a full facelift with improved access, new parking controls, and refreshed landscaping. This upgrade will improve guest access, safety and overall appearance of WRHS’s nearly 8-acre site in University Circle. There will be a period during this process when access to the parking lot and the Reinberger entrance will be restricted. Limited accessible parking will be available at the half circle drive off East Blvd. Alternate parking can be found throughout University Circle and at the VA parking garage. Guests are encouraged to consider taking advantage of the Circle Link shuttle transportation that circulates throughout Wade Oval. Runs every 23 minutes from 6:15 a.m. to 5:30 p.m., Monday through Saturday, and every 35 minutes from noon to 5:30 p.m. on Sunday. Holiday hours may vary. Red Circles indicate shuttle stops along the route. Scheduled every 15 minutes from 6 a.m. to 9 p.m. on weekdays, but not major holidays. Blue Circles indicate shuttle stops along the route. The Heights a.m. loop runs 7 a.m. to 11 a.m., Monday through Friday during the CWRU school year. No service is available on holidays or during breaks. Commuter shuttles run continuously from 5:15 p.m. to 12:30 a.m. Sunday through Thursday and from 5:15 p.m. to 2:30 a.m., Friday and Saturday. The CWRU North Campus buses arrive at designated stops approximately every 20 minutes. The South Campus buses arrive approximately every 25 minutes. South Loop route is highlighted in blue; North Loop route is highlighted in orange. Each circle indicates a shuttle stop on the route. The UCRC shuttle runs to the CWRU BioEnterprise building and along Cedar Avenue. It arrives at designated stops approximately every 25 minutes from 6:15 a.m. to 7 p.m. weekdays, but not major holidays. Stops are made on an on-call basis for Ronald McDonald House. For continued updates on the parking lot renovation, follow WRHS on Facebook and Twitter. 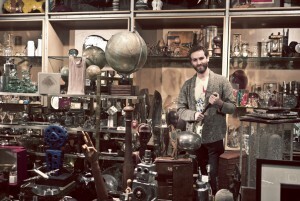 Do you have valuables in your man cave? Have them appraised during Man Cave Trash or Treasure at WRHS History Center! CLEVELAND, OH – Have a shoebox of baseball cards? A signed jersey? Maybe even your grandfather’s military uniform? Considering bringing them to “Man Cave Trash or Treasure,” a verbal appraisal event taking place on Saturday, April 11 at the WRHS History Center in University Circle. This year’s annual event features appraisers from Fusco’s Auctions, Great Lakes Coin & Jewelry, Milestone Auctions, Quaker Square Comics, and CW Trains, LLC. Representatives from the Siegel & Shuster Society will also be on site to discuss the developments of a Superman statue planned for the lakefront. 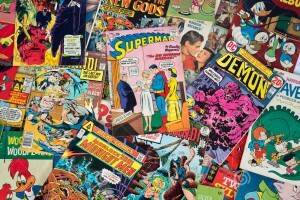 The group is dedicated to promoting Cleveland as the place where Superman was created as well as the hometown of the two men who made him a reality. Last year’s event, which featured Wes Cowan and his team from Cowan’s Auctions, welcomed nearly 300 guests. Visitors planning to attend are encouraged to pre-register in advance, either online or by calling (216) 721-5722 ext. 1502. Those who have questions about the acceptability of their items should call that same number. For further updates, follow WRHS on Facebook and Twitter. 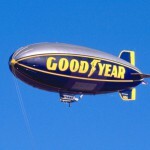 CLEVELAND, OH – The Setting the World in Motion exhibit at the WRHS History Center will soon have a newcomer: the donated gondola from the Spirit of Goodyear blimp. The gondola’s unveiling will take place at 1:00 pm on Wednesday, February 25, 2015 at the WRHS History Center. The gondola, which is the pilot and passenger compartment of the blimp, will be placed next to the recently opened Euclid Beach Park Grand Carousel in the exhibit. At 23 feet long and 3,400 pounds, the gondola is now one of the largest artifacts in the Crawford Auto Aviation Museum. The gondola appeared over some of the world’s largest sporting events such as the Super Bowl in 1990, 1994 and 1995, Major League Baseball World Series games in 1982, 1983 & 1984, The Kentucky Derby, the Daytona 500, U.S. Open tennis and golf, NCAA football, including the Cotton Bowl in 1990, NCAA Final Four basketball and NFL games. 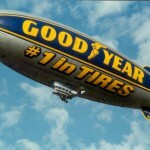 In addition, well-known celebrities, such as David Letterman and astronaut Dr. Sally Ride, have flown in the gondola. The Crawford Auto Aviation Museum of the Western Reserve Historical Society depicts the automobile various stages of development, both on a national and regional level. In includes over 140 antique automobiles, 21 non-car transportation artifacts (motorcycles, bicycles, and boats), 10 aircraft, and 3 carriages and sleighs. The Collection is enhanced further by the WRHS Automotive Marque Files, which include automobile brochures, owner’s manuals, advertisements, and more. Its automobiles and artifacts are the centerpieces of two major exhibits at the WRHS History Center in University Circle: Setting the World in Motion and REVolution: The Automobile in America. CLEVELAND, OH – The Western Reserve Historical Society’s Library is pleased to announce the availability of the Leo A. Jackson Papers. The papers have been fully processed, cataloged, and are now open for research. Funded by generous support of the United Black Fund, this collection is a significant addition to the rich tapestry of African American history available at the Western Reserve Historical Society. Serving Cleveland from the 1950s-1980s, Leo Albert Jackson (1920-1996) was an African American attorney, judge, and politician. A veteran who served in the U.S. Army, Jackson graduated from Morehouse College in 1943, and obtained a Master of Arts degree from Atlanta University in 1946. 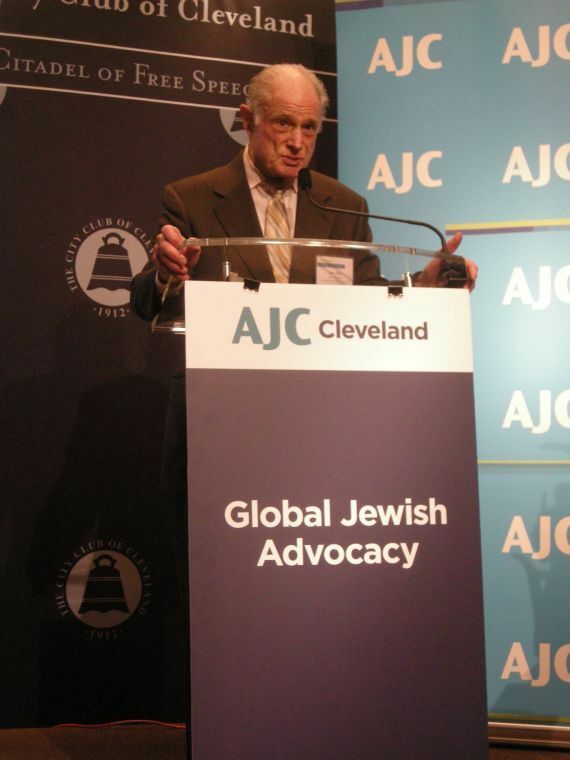 He obtained his law degree from Cleveland Marshall College of Law in 1950. In 1957, he was elected to Cleveland City Council as the Ward 24 representative. He served there until 1970. This collection is important in its depiction of Jackson and his experience as an African American community leader and city official. Through the papers, researchers get a strong sense of the government and political climate of Cleveland from the late 1950s-1970. 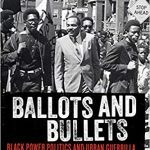 Areas of interest profiled by the collection include housing and zoning concerns, racial tensions, relations with the police, the Hough Riots, and unrest in Glenville (including the Glenville Shootout), as well as how politics in the city was affected by these types of issues. Recent national events which have (from Cleveland, to New York, to Ferguson) ignited racial tensions and brought police practices into question can also be explored through this specific collection. Researchers can follow Jackson’s career as an African American councilman and see how he applied and interpreted his experiences as he became a judge on Ohio’s Eighth District Court of Appeals in 1970. A full description and inventory of the collections is available online. Jackson served three consecutive terms on the district court, twice as chief judge, and had a special assignment to the Ohio Supreme Court. He was active in many community organizations in the Cleveland area and received numerous awards for this work. He retired from the bench in 1987. Later, Judge Jackson would collapsed at the County Court House, and be pronounced dead at Lutheran Hospital on April 19, 1996. During his council career representing Cleveland’s Glenville neighborhood, Jackson fought for civil rights, introduced gun control legislation, and was dedicated to community development in his ward. He faced controversy on racial issues as a moderate African American who did not ally with the black power movement. He was also active in the county, city, and state Democratic parties and involved in various local issues like the Cuyahoga County Charter debate. Established in 1970, the African American Archives of the Western Reserve Historical Society are an ongoing initiative to collect, preserve, and make accessible materials that profile the African American experience in Northeast Ohio. Cleveland, OH— The Western Reserve Historical Society announced today that Richard Shrake will join the museum as the Director of the Research Library. Shrake, a native of Akron, Ohio, was most recently the Associate Librarian for Technical Services at the American Philosophical Society in Philadelphia, Pennsylvania. Shrake has been a Certified Archivist since 2005 and is an active member of the Academy of Certified Archivists, serving on both the Nominations Committee and the Exam Development Committee. As a member of the Society of American Archivists, he has presented several papers and conducted workshops for a number of industry conferences. The WRHS Research Library is home to over 4 million photos, countless community history archives, genealogy resources, and collections that span local and national history. In one of its most recent projects, the Research Library made over 2,800 finding aids available online through OhioLINK. OhioLINK is an online repository that allows anyone with a computer to access the digitized collections within an institution’s auspices. To date, WRHS is the institution that has contributed the most digitized finding aids to OhioLINK. CLEVELAND, OH – Euclid Beach Park was a longstanding Cleveland icon, attracting locals, visitors from afar, and even presidential candidates to the shores of Lake Erie to enjoy the sights and sounds of one of the nation’s best-known amusement centers. When the park closed in 1969, the Carousel’s long journey back to Cleveland began and this year, on November 23, the Euclid Beach Park Grand Carousel will operate once again at the Western Reserve Historical Society’s (WRHS) History Center in University Circle. Two rides are included with the cost of general admission: $10 for adults, $9 for seniors 62+, and $5 for children ages 3-12. Each additional ride will cost $3 and can be purchased on-site. Admission can be purchased online in advance, but rides will be available on a first-come, first-served basis. Built by the Philadelphia Toboggan Company in 1910, the Carousel that operated at Euclid Beach Park featured 58 hand-carved wooden horses, 54 of which still exist today and will be available to ride on the newly restored Carousel. 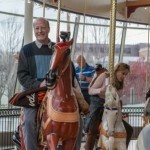 In addition to the horses, visitors can experience rides on the Carousel in two chariots, one of which is a newly created chariot accessible to all and another that is original to the 1910 carousel. The second original chariot will be placed in the Carousel Pavilion as a photo opportunity for visitors. The restoration work on the Grand Carousel was done by Carousel Works in Mansfield, Ohio. Carousel Works is the largest manufacturer of wooden carousels in the world. In June 2010, the relationship between The Cleveland Carousel Society, Euclid Beach Park Now, and WRHS was formed. 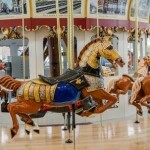 The three institutions have been working together to fundraise and restore the Grand Carousel to its original splendor. The friends and supporters of the project will gather to experience its first turns on Saturday, November 22. More information about the Opening Celebration and continued sponsorship opportunities is available online. Tickets to the Opening Celebration are available to the public for purchase. CLEVELAND, OH – In the late 1800s, Cleveland was one of the great American cities. Much like New York’s social elite, its wealthy residents lived in high style. Elaborate customs and extravagant entertainments characterized the lifestyle, which required suitable wardrobes often acquired in Paris. Historic garments and accessories will soon be on display in a new exhibit at the Western Reserve Historical Society’s History Center, In Grand Style. These fashions from the 1870s to the 1930s provide a window into the world of privileged Cleveland. In Grand Style, which opens to the public on Saturday, November 8, showcases luxury and local history. 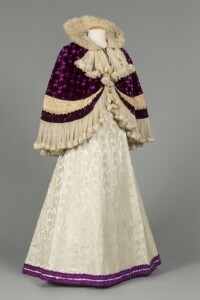 The exhibit, made possible by the Museum Advisory Council and The Payne Fund, features thirty-five ensembles drawn from the historic costume collection of WRHS. The ensembles span from the 1870s to the early 1930s, a period comparable to the one depicted in the popular PBS program, Downton Abbey. In Grand Style will feature women’s clothing along with several men’s and children’s ensembles to paint a picture of the entire family. Notable Clevelanders are represented throughout the exhibit, many of whom resided in impressive mansions on “Millionaire’s Row,” a stretch of about 40 residences on Euclid Avenue from East 12th to East 55th Streets. The area was home to some of the world’s most powerful industrialists and their families. Familiar people featured in the exhibit include fashion icon Phyllis Peckham, First Lady Lucretia Garfield, and the Wade family. In addition to the garments in the exhibit, accessories such as exquisite fans, elegant shoes, and beaded bags will also be on display. 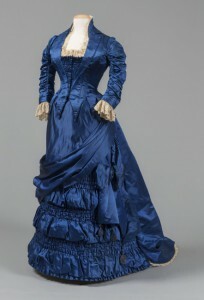 Portraits of prominent Cleveland residents, some of whom are depicted in the displayed ensembles, will further demonstrate the high manner of living in Cleveland during the time period. 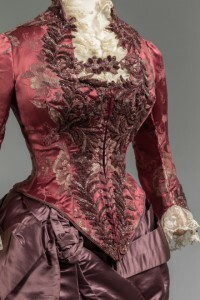 In Grand Style will be housed in the Chisholm Halle Costume Wing at the WRHS History Center, which recently underwent improvements to help ensure the longevity of garments in future exhibits. Generously paid for by The Payne Fund, these improvements include a motion detector system to regulate lighting that will minimize its damaging effects on fabrics in the gallery. The exhibit will open November 8 and is free with general admission to the History Center. In the Hale Café visitors are able to enjoy a variety of different seasonal offerings such as locally brewed beer and wine, apple and pumpkin treats, kettle corn, and more. Admission is $10 for adults, $5 for children 3-12, and free for WRHS members and children under the age of 2. The admission price to the Harvest Festival includes festival activities and access to the heritage gardens of Hale Farm as well as the always-available early American craft and trade demonstrations, which include glassblowing, blacksmithing, pottery, and spinning and weaving. In addition to the events of the festival each weekend, Hale Farm also hosts the Hale Harvest 5K on the morning of October 4th. The three-mile loop course invites runners and walkers to experience the natural beauty of Hale Farm as they run along nature trails, through the Hale sugar bush, past historic houses, in farmyards, and across creeks. The top three finishers overall and the top male and female finishers per category receive handcrafted pieces from Hale Farm & Village’s early American craft and trade artisans. Registration is $25 per runner and includes free admission to the Harvest Festival on race day. Runners can register online by clicking here. For photos from last year’s race, click here. The Marketplace at Hale Farm & Village will be open for shopping during all festival dates. The Marketplace features products handmade by the artisans at Hale Farm, including blown glass and pottery, and many other local items and seasonal souvenirs. Hale Farm & Village, a living history museum of the Western Reserve Historical Society, is located on 90 acres with 32 historic structures, farm animals, heritage gardens, farming, and early American craft and trade demonstrations. The location is open on Saturdays and Sundays during the months of September and October. From November-May, the site is open for special programs and reservations only. Visit www.halefarm.org or call (330) 666-3711 ext. 1720 for seasonal hours, program listings, rental information, and turn-by-turn directions. CLEVELAND, OH – The Western Reserve Historical Society (WRHS) is launching an exhibit commemorating the 50th anniversary of the championship season of the Cleveland Browns. The new exhibit, 1964: When Browns Town was Title Town, focuses on the excitement the community felt as well as the team’s place in history as an underdog team unexpectedly won a championship in a crushing victory. Under Coach Blanton Collier, the Cleveland Browns beat the favored Baltimore Colts to win the NFL Championship 27-0 in front of over 79,000 fans on December 27, 1964. A wide range of Browns memorabilia relating to the championship team will be included in the exhibition, which was initiated by avid Browns fans and guest curators Kermit and Joyce Pike, who began their extensive collection with their season tickets and game-day memorabilia from1964. One of the special features of their collection is Browns football cards, including the number one Jim Brown Master Set on the Professional Sports Authenticators registry. After retiring from WRHS as Library Director and Chief Operating Officer, Pike added to his collection to include programs, pennants, autographed footballs, photographs, jerseys, and other souvenirs. Educational and community programs throughout the run of the exhibit featuring speakers, panels, and guest appearances will explore the larger history of the Browns franchise over the 50 years since the championship. They will paint a picture of what the city of Cleveland was like in 1964, a time of great social change and urban renewal. The exhibit runs September 6 through February 2015 at the History Center in University Circle. The exhibit opens with a Preview Party September 5, and a Tailgate Party September 6. 1964: When Browns Town was Title Town is made possible by the following sponsors and partners: PNC, University Hospitals, Ohio Savings Bank, a division of New York Community Bank, ESPN Cleveland, Lufthouse, and Buffalo Wild Wings. Donors include: Bob and Sally Gries, as well as Don and Mary Jo Dailey, Jack Herrick, John J. and Mary A. Jenkins, and Jim and Anne Schoff. Honorary Exhibit Co-Chairs include Bob and Sally Gries, Paul and Jill Clark, and Jimmy and Dee Haslam. Exhibit Co-Chairs are Jim and Anne Schoff. Cleveland, OH— In San Francisco in 1982, Tom Waddell and 1,350 athletes from all over the world would make history in the most inspiring way in the first ever Gay Games. This year, the 9th Gay Games will come to Cleveland and to commemorate their arrival, the Western Reserve Historical Society will unveil a new exhibit, The Victory of Self: The LGBT Community in Northeast Ohio. The exhibit will be on display during regular museum hours beginning July 20, 2014. General admission costs apply—however, WRHS is pleased to extend a $2 discount to all Gay Games participants who produce credentials upon entry. Objects, banners, photographs, newspapers, video recordings, and more from the WRHS LGBT Archives will come together to provide the visual background for the exhibit and touch upon a variety of aspects of the LGBT community’s history from the pre-Stonewall period to the present. Each aspect will contribute to the broader narrative of the cultural and social infrastructure of the community. WRHS is a community partner of the 9th Gay Games. WRHS appreciates the support of Liz Roccoforte and the Lesbian Gay Bisexual Transgender Center at Case Western Reserve University, Chris Rogers of Vision Video, and Phyllis Harris, Ryan Zymler and the staff at the LGBT Community Center of Greater Cleveland in making the implementation of this exhibit possible. Access to the exhibit is free with the price of general admission to the WRHS History Center: $10 adults, $5 children ages 3-12, and free for WRHS members. The Gay Games is an international sporting and cultural event held every four years under the founding principles of Participation, Inclusion and Personal Best™. Launched in 1982, the Games invite participation from everybody regardless of sexual orientation, race, gender, religion, nationality, ethnic origin, political beliefs, athletic or artistic ability, age, physical challenge or health status. The Games are intended to bring a global community together in friendship, to experience participation, to elevate consciousness and self-esteem, and to achieve a form of cultural and intellectual synergy. The Gay Games is open to anyone 18 years or older. About 10 percent of participants are from outside the LGBT community. The Western Reserve Historical Society is the premier center for collecting, preserving, and sharing the history of Northeast Ohio. As a testament to its financial solidarity, the organization has received the coveted four-star ranking from Charity Navigator, America’s largest independent charity evaluator. WRHS received a 70 out of 70 on “Accountability and Transparency” from the evaluation service, acknowledging the highest levels of financial stewardship and professionalism. The History Center is located in Cleveland’s University Circle at 10825 East Boulevard. Museum hours are Tuesday – Saturday, 10 am to 5 pm; Sunday, Noon to 5 pm. Admission is $10/adult, $9/senior 62+, and $5/child age 3-12. The Research Library is open Thursday – Saturday from 10 am to 5 pm. Western Reserve Historical Society members and children two years and under are admitted free of charge. Group rates are available. The History Center is handicap accessible, with an elevator providing access to various levels of the museum. BATH, Ohio— Imagine an open field flanked by woods suddenly full of clashing soldiers, cavalry horses, and clouds of smoke. The Third Battle of Winchester, which took place in the Shenandoah Valley in September of 1864, will be re-created for visitors at the 26th annual Hale Farm & Village Civil War Reenactment. The event will take place Saturday and Sunday, August 9 and 10, with the battle beginning at 2:00 pm each day. “Each summer we welcome thousands of spectators and reenactors to Hale Farm & Village for the Civil War Reenactment event,” said Jason Klein, site manager at Hale Farm. “We like to take a deep look at how we can keep the event exciting and engaging for our visitors, staff, and the reenactors who take part in it each year. So each year the battle and the staging of it evolves. This is a unique feature in reenactments and we know that our visitors –and the reenactors themselves—appreciate that it is more work, but it’s a new insight to a piece of history. So that makes for a better experience. The Battle of Winchester took place in the Shenandoah Valley, parts of which look almost exactly like the backdrop here at Hale Farm & Village in the Cuyahoga Valley.” A YouTube video conveys the excitement of the battle which was held last year. Suttlers Row, lined with merchandise and vendors from the Civil War era, will be back this year. Visitors can choose from a variety of different items; Civil War-themed books, vintage photos, clothing, and more. On both sides of the site, encampments for the Confederate and Union armies will be constructed, allowing visitors to interact with reenactors in character of the era. Visitors can ask about how the war is going or what they are going to have for dinner and the reenactors will answer from the period of the Third Battle of Winchester in 1864. 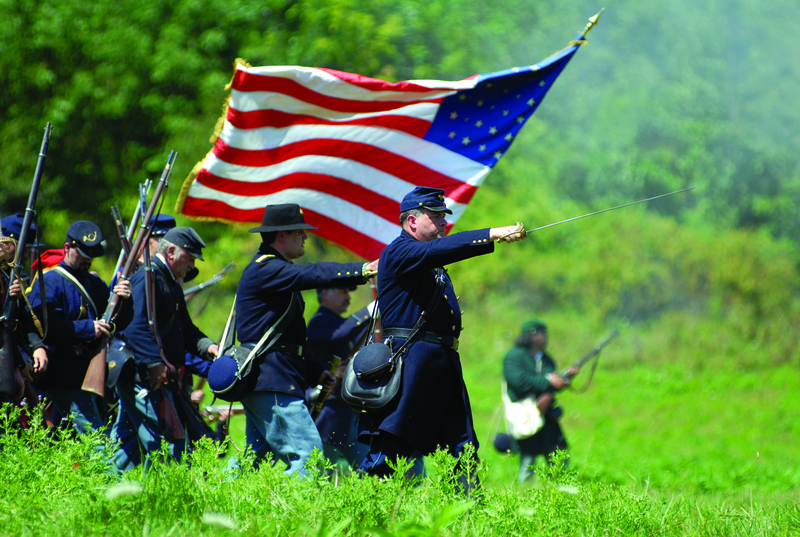 Advance tickets for the Civil War Reenactment are available online. Admission is $10 for adults, $5 for children ages 3-12, and free for WRHS members and children under the age of 2. For a glimpse into the Hale Farm Civil War Reenactment, watch this YouTube video. There is ample parking at the site and there is a drop off lane to bring people to the front door for guests with limited mobility. The site can accommodate wheelchairs and strollers. Many paths that lead away from the Gatehouse are gravel, so please anticipate this type of terrain. The Gatehouse has handicap accessible rest rooms and visitors can see the battle from an accessible area outside the Gatehouse. 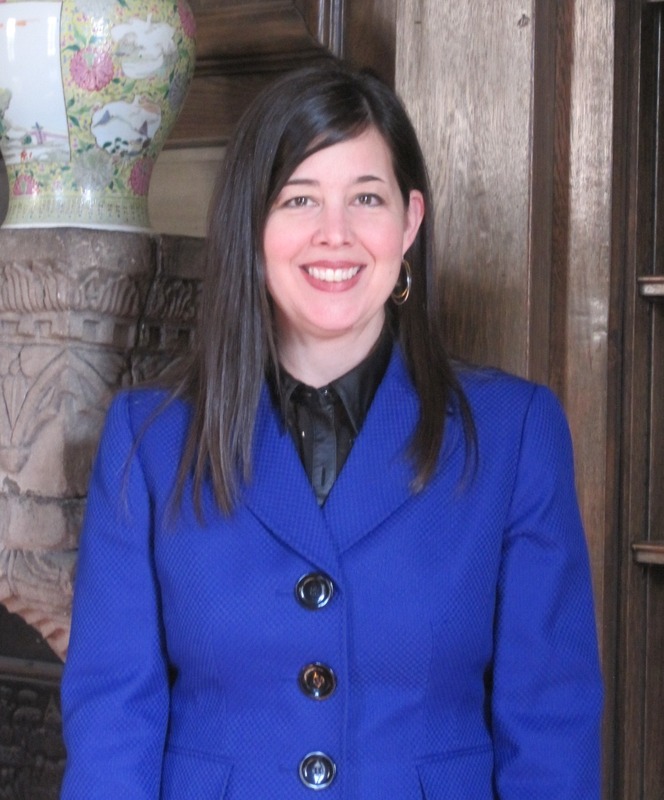 Cleveland, OH— Kelly Falcone-Hall has been named Chief Executive Officer of Western Reserve Historical Society (WRHS). The announcement was made by Don Dailey, Chair of the Board of Trustees, at the June 25 board meeting. Falcone-Hall had been serving as Interim CEO of WRHS for six months. Falcone-Hall is a resident of Westlake, Ohio. She joined WRHS in 1995 as a reference assistant and manuscript processer. She has served in positions of increasing responsibility at WRHS over the last 19 years, including Director of Interpretation at Hale Farm & Village, Vice President of Hale Farm & Village, Vice President for Institutional Advancement, Chief Operating Officer, and Interim Chief Executive Officer, before being promoted to CEO. At Hale Farm & Village, Falcone-Hall developed popular public programs, including the Holiday Lantern Tours and A Fugitive’s Path: Escape on the Underground Railroad. Her research and leadership deepened the living history museum’s interpretation of the early American crafts and trades, improved restoration of Hale Farm’s buildings and grounds, and guided the location’s mission and strategic initiatives. She developed the concept of InHale as an educational and experiential initiative to reconnect people to the world around them through sharing stories about the Hale family and providing a variety of experiences based on the life of an Ohioan in the 1800s. She is the author of Hale Farm & Village, a booklet about the history of the re-created village and living history museum in Bath Township, Ohio. Falcone-Hall was instrumental in bringing the 2013 national conference of the Association for Living History, Farm and Agricultural Museums to Akron and Bath Township. The event drew international interest to Hale Farm & Village and Western Reserve Historical Society. “I am humbled by this vote of confidence in my leadership and in the team at Western Reserve Historical Society,” said Kelly Falcone-Hall. “This is a phenomenal institution with a mission that is vital to preserving history. The future is very bright for us. All the pieces are in place to truly jump to the top of mind position for anyone looking to find out about any history in Northeast Ohio. I feel as if I have been preparing for this opportunity all my life.” Ms. Falcone-Hall is the 10th person to hold the most senior position at WRHS. The Western Reserve Historical Society is the premier center for collecting, preserving, and sharing the history of Northeast Ohio. As a testament to its financial solidarity, it has received the coveted four-star ranking from Charity Navigator, America’s largest independent charity evaluator. WRHS received a 70 out of 70 on “Accountability and Transparency” from the evaluation service, acknowledging the highest levels of financial stewardship and professionalism. 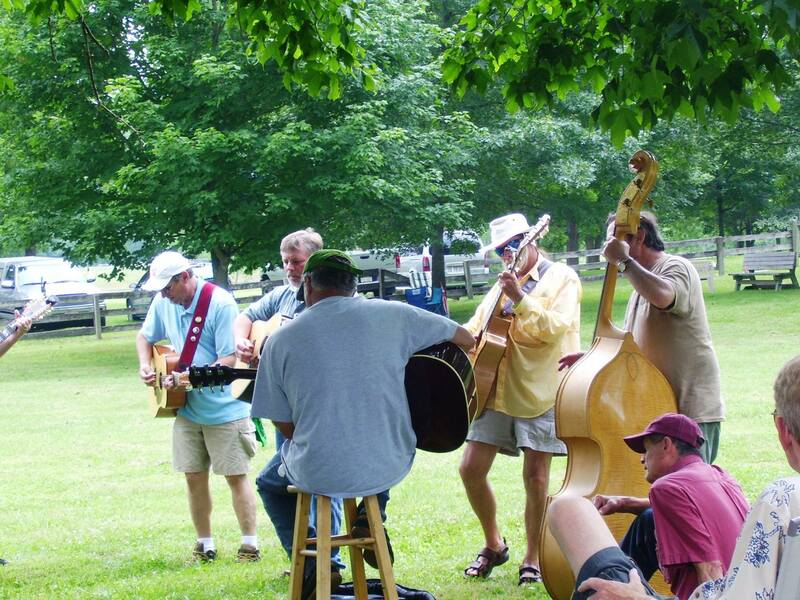 BATH, Ohio – Sip a glass of wine while listening to local folk musicians at Hale Farm & Village’s Music in the Valley Folk Music & Wine Festival, July 12-13, 2014, from 10 am to 5 pm. This is the festival’s 40th year and while the music part of the event will be familiar, the addition of a wine garden is something new. Hale Farm partners with Folknet each year to present the festival. Folknet is an organization dedicated to the development, expansion, and celebration of folk music and traditional arts. Its musicians will perform on rustic stages made of straw bales, benches and barn floors. While guests tour the beautiful property and experience all that Hale Farm has to offer, the sounds of dulcimers, banjos and fiddles will fill the air. All regular museum craft and trade demonstrations will be open to the public. Guests are encouraged to bring a chair, sample the wines, and make a day of listening to music throughout the scenic grounds. Admission is $10 for adults, $5 for children 3-12, and free for WRHS members and children under age 2. Tickets can be purchased online at www.halefarm.org. For more information, call 330-666-3711. Cleveland, OH—Congressman Louis Stokes has been named an Honorary Trustee of the Board of Directors at the Western Reserve Historical Society (WRHS). Stokes, who served as a board member of the institution for nine years, announced his retirement from his post for the end of his term June 30, 2014. The Board unanimously elected Stokes to the honorary designation to recognize his contributions not only to WRHS, but to Cleveland and the county. The designation of Honorary Trustee has been awarded to only a handful of individuals in the 147 year history of WRHS. Stokes began his career as a lawyer with a special interest in activism in the arena of civil rights. It was the relationship he built with the Cleveland community through civil rights law that led him to run for office. In 1968, Stokes became the first African-American elected to the United State House of Representatives from the State of Ohio. He served 15 consecutive terms, totaling 30 years of service. Stokes was a strong advocate of education, affirmative action programs, housing and development projects, and healthcare improvement initiatives. 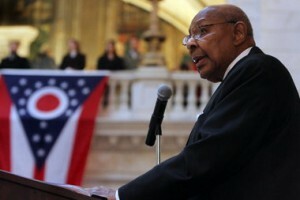 The Louis Stokes wing of the Cleveland Public Library, the Louis Stokes Cleveland Department of Veteran Affairs Medical Center, and Greater Cleveland RTA’s Louis Stokes station at Windermere, are a few of the locations in the Cleveland area that bear his name as a testament to his service and his invaluable contribution to the area and the country. 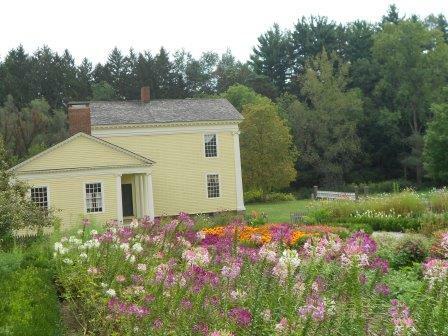 BATH, Ohio— Come explore the historic homes and charming gardens of Hale Farm & Village at the second annual Home & Garden Tour, June 21 – 22, 2014 from 10 a.m. to 5 p.m. Celebrate preservation in the Western Reserve and learn the architectural history and stories behind the historic buildings on-site: who first lived in them, how they were moved, and how they were restored. 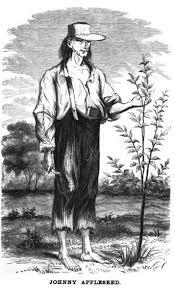 Meet the people who tend the gardens of Hale Farm and find inspiration for your own garden. The houses in the Village span the time period of Federal through Greek Revival architectural styles. The Herrick house, a stone residence built in 1845, was completely disassembled before it was moved. Each stone was numbered, and then moved in 1981 from Twinsburg, Ohio to Hale Farm, where it was reconstructed. In addition to learning about the structures at Hale Farm, visitors can hear about historic horticulture and hearsay while taking part in hand-on experiences in the gardens. Volunteers and partners that help Hale Farm keep its historic structures and gardens looking fresh will also be on-site during the event: Bath Gamma Garden Club, Great Lakes Brewing Company, Medina Spinning and Weaving Guild, Smaht Farm, the Village Quilters, and more. Visitors can also learn about Great Lakes Brewing Company’s Pint Size Farm, a 6,000 square foot garden plot the restaurant started in 2008 at Hale Farm. Filled with vegetables, herbs and flowers for the Ohio City restaurant, the plot is fertilized with the spent grain from the brewing process. Enjoy lunch in the Hale Café and take home a “hand-crafted at Hale” souvenir from the museum store. Tickets to the event are $10 for adults, $5 for children 3-12, and free for WRHS members and children under age 2. Tickets can be purchased online at www.halefarm.org. For more information, call 330-666-3711. 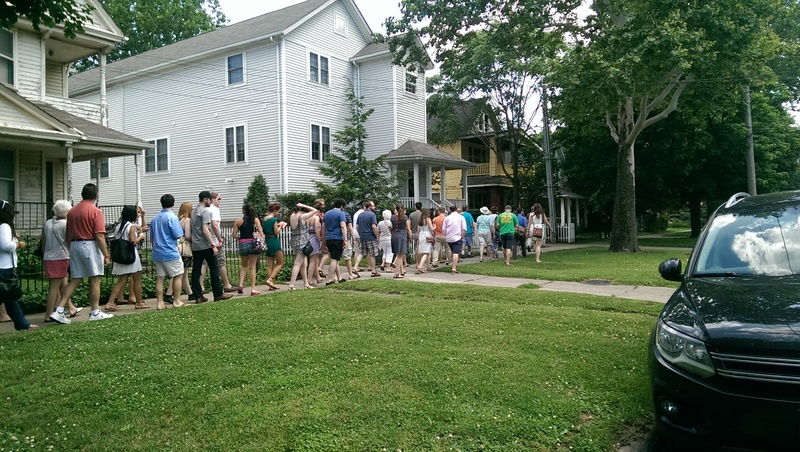 Cleveland, OH— If beer and history are two of your favorite things, consider joining the Western Reserve Historical Society’s Young Professionals at their annual Historic Pub Crawl on June 28 beginning at 2:00 pm. This year, the pub crawl will take guests through the historic west-side neighborhood of Tremont. With tickets available for just $10, participants will receive a wrist band and drink specials at four unique Tremont watering holes: The South Side, Hotz Café, Lincoln Park Pub, and Edison’s. Each of these locations holds historic value to the area, which has experienced significant growth and change since its development in the late 1800s. Dr. John Grabowski, Senior Vice President for Research and Publications at WRHS, will be on-hand to tell the historic stories of Tremont during the Pub Crawl. Each location has its own interesting quirks, architectural background, and historic significance. “All of Cleveland’s neighborhoods have strong historic and cultural backgrounds,” says Grabowski. “Tremont is fascinating in the fact that it has undergone so much change over the last 100 years and has grown to be one of the cultural and culinary hubs of the city while keeping intact much of its historic architecture. The Young Professionals are an auxiliary group of the Western Reserve Historical Society. The group connects the past to the present through a variety of engaging programs and social events. Members of the group enjoy members-only events of WRHS, free admission at both Hale Farm & Village and the History Center, and more. To join the WRHS Young Professionals, email yp@wrhs.org. Oval institutions, which will be open from 10 a.m. to 5 p.m.
them throughout the past 100 years. exhibition is scheduled to close on May 25.
will feature 14 LEGO brick sculptures depicting plants and animals. 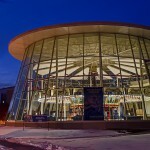 History will include free entry to Shafran Planetarium for the first time ever. Road or Ford Road station. For more information, go to www.rideRTA.com. For more details on Cleveland Foundation Day on Wade Oval, visit www.clevelandfoundation.org/WadeOval. drew a record-breaking 35,700 visitors.